Some people think that scotch can’t make a good cocktail, or that scotch is too precious for a cocktail, or that even if you can make a scotch cocktail, it couldn’t possibly be a light cocktail. To them we say: try this one. If you don’t have sage leaf syrup, use agave syrup. You can skip the peach bitters if you want, but we find they add a certain je ne sais quoi. Fill a Boston shaker with ice. Pour in Laphroaig, Chartreuse, lemon juice, syrup, and bitters. Shake well. 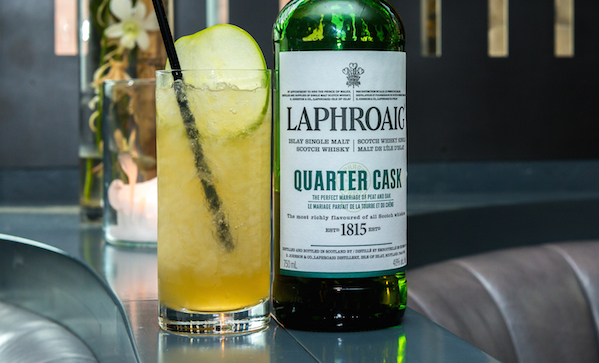 Strain into an ice-filled Collins glass. Top with ginger beer. Garnish with green apple fan.